The “everything” part is what scares me. I’m never sure what “everything” is or what it means. When diagnosing any plant disorders, problems or conditions – you need the most COMPLETE INFORMATION possible. Usually some info goes missing. To confuse things more, various disorders may produce almost the same visual symptoms. The TV show “House” is not for everyone, old House can be rude, somewhat cranky, obnoxious, insensitive and plain old irritating! One reason I enjoy “House” is the way the “team” eliminates the problems with their differential diagnosis. They list all the “symptoms” they can think of, discuss what could cause the “symptom”, and begin working backwards by eliminating potential causes to find the best remedy or solution. Figuring out plant problems – indoors or out – is no different. Do you think it is fungl disease killing the Devil’s Ivy plant? If that is the case, will use of this systemic fungicide maybe save what few stems still survive? Is there a better remedy to use against fungus? My Dracaena flourishes, thanks to following the advice in your splendid book. All the questions below could be asked slightly different depending on the plant variety or if the plant was inside or outside. 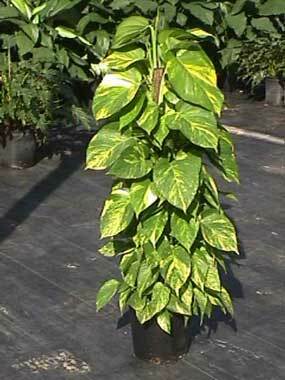 1 – My problem is my Epipremum plants in my living room, very tall and initially each with multiple plants in each pot. How long have you owned the plants? If new… when did you buy it, how did you transport it? How long has the plant been in its current location? Has the watering schedule changed? Has the water source changed? Has the person caring for the plant changed? What type of pot is the plant potted in? Has the plant been repotted? If you have had the plant for a long time (years), when was the last time it was repotted? Do you fertilize the plant? What is the fertilizer rate? What time of the year did you fertilize? Is the soil moist or dry when you fertilized? What does the root system look like? Do you have any animals or new animals in the house? How much light does the living room get? How warm, cold or hot does the room get? Was the room painted recently? If so with what/by what? If multiple are both doing bad or is just one? If one what is different with them? Location, lighting, watering, etc.? 2 – Progressively on each of the plants leaves begin to droop, loose color, shrivel, become brown and drop off. Is this only the leaves on the plant? Do the stems die as well? When the leaves fall off are they dry or wet? Do the leaves fall off in the middle of the plant or at the end? Is the leaves a new young leaf or an old one? 3 – I have tried everything, and finally I have used the only anti-fungal I chemical I can obtain, Bayer “Fungus Fighter”, which of course is a systemic fungicide, said to be for “ornamentals”. Fungus may be the problem, but usually inside where the air is dry – much less likely. It could be salts from fertilizer, a weak root system, root mealy bugs or other pests. Without complete answers to the questions is it difficult to provide any “good” answer. I encountered a problem like this last December, when friends of mine went out of the country for over a month during the holidays. They live in a condo and had someone water the plants. Her plants always look Fabulous! When the family got home her 3 year old, at one time absolutely gorgeous 10″ Aglaonema looked like it had melted. Heartbroken she called me, asking what she could do. I went over to examine the patient. Basically, the person asked to water, over-watered the plant. The plant was basically swimming in water. I drained the water from the plant and brought it home. No amount of fungicide would or could have helped this plant. I pulled all stems out of the pot. The next day I soaked the cuttings in a neem oil solution. Allowed the stems to air dry again. Replanted the rooted cuttings into a new “soda container” with LECA stone. I am all for saving plants. However, sometimes if you want to save your “ailing” plant, they may need “rebuilding” from the ground up. When diagnosing plant problems, If the plant was doing well before – Look for what has changed? Always asked – What Changed? If the plant is new, you know what changed – location, lighting, environment, watering, etc. Allow the plant to acclimate. How long have you had the plant? Have you moved the plant from one area to another? Did you have a party? – Plants and alcohol do not mix. The show “House” comes on Monday nights. Watch it and improve your plant care with differential diagnosis. 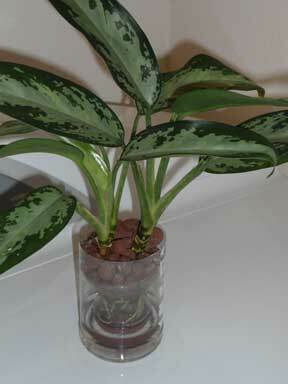 Fertilize House Plants | Burning Leaves Something to Avoid?